By now, we have all heard of the refugee crisis which has been globally unfolding for some years now, from Syrian civilians fleeing barrel bombs and chemical attacks to the plight of the Rohingya people facing ethnic cleansing in Myanmar. From the safety of our homes or offices, it is easy to dismiss the repetitive headlines and news alerts as a sad reality we should just get used to. And Human Flow, an epic documentary film by Chinese artist and activist Ai Weiwei, has just made it much harder to do so. Filmed in 23 countries with the help of over 200 crew-members, Ai’s evocative and immersive film traces the perilous journeys undertaken by people fleeing turmoil with a deeply affecting empathy. Both intimate and epic, it tells the personal stories of those behind the statistics through a cinematic language that weaves together poetry with hard facts, laughter with adversity, and the tragic with the staggeringly beautiful. It’s a film with two complimentary goals, giving a voice to those that circumstances have robbed them of one, and alerting those more fortunate, who think this crisis has nothing to do with them, that this is something you cannot turn away from. Because at the end of the day, those of us who live in peaceful countries do so from arbitrary accidents of geography. It all started in 2015 on a trip to Greece with his young son when Ai witnessed an inflatable boat overloaded with migrants landing on the island of Lesbos. 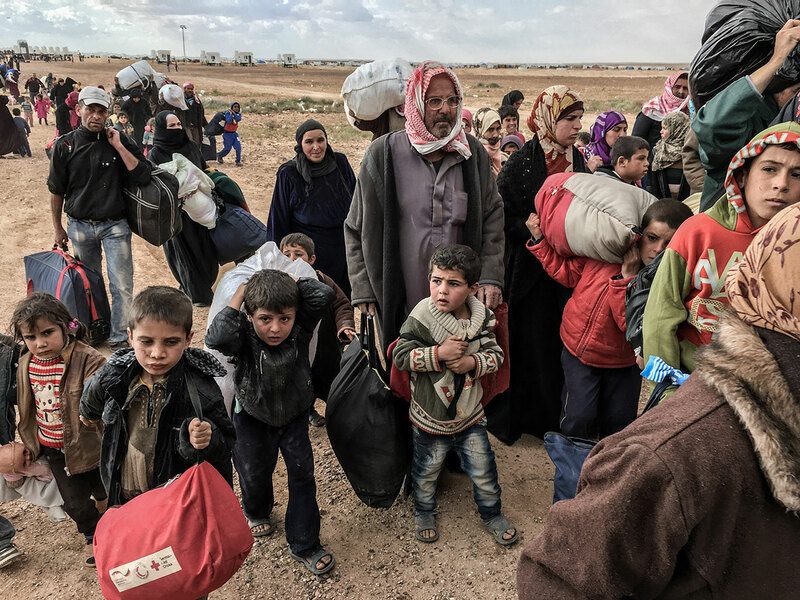 By that time the Syrian civil war had been waging for four years with almost half of the population displaced and 3.8 million having fled the country (the number has since risen to 5.4 million), most of whom are confined in overcrowded refugee camps in Lebanon and Turkey. Many of the those refugees, along with others fleeing mayhem, persecution and poverty in countries such as Iraq and Afghanistan, sought to seek asylum in northern Europe and start a new life. But to do so they first needed to make their way there, a dangerous trip that involves crossing over from Turkey to Greece, or more precariously from Libya to Italy, on shoddily constructed boats, mercilessly overloaded by smugglers; which has resulted in hundreds of them drowning, tragically exemplified by the sight of three-year-old Aylan Kurdi’s body on a Turkish beach in September of 2015, a heart-breaking scene that the artist later recreated with his own body in a haunting black and white photograph. Theatrical one-sheet for HUMAN FLOW, an Amazon Studios release. Photo Courtesy of Amazon Studios. Refugees walking near Idomeni Camp, Greece in HUMAN FLOW, an Amazon Studios release. Photo courtesy of Amazon Studios. 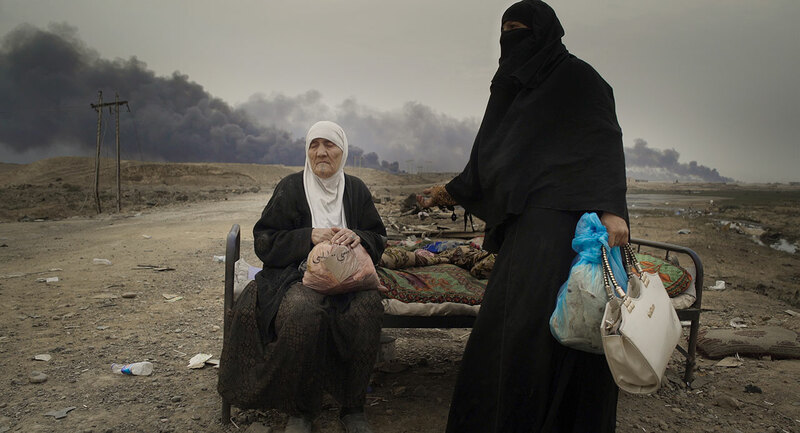 Two women pictured in Mosul, Iraq. From HUMAN FLOW, an Amazon Studios release. Photo courtesy of Amazon Studios. 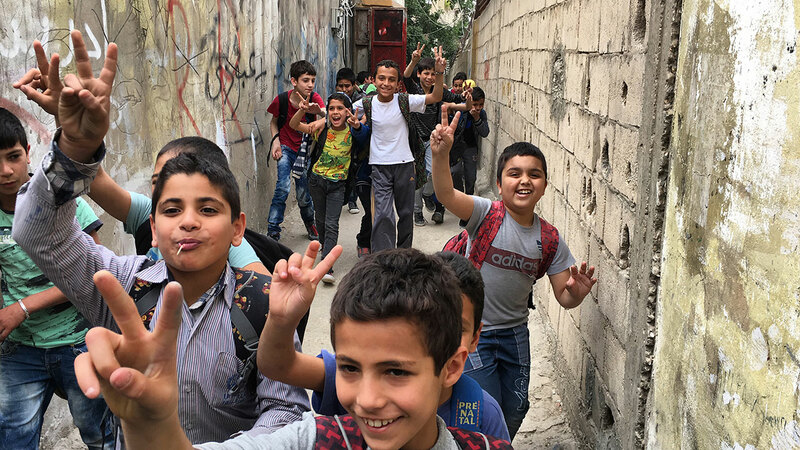 A group of children run through Ain al-Hilweh, the largest Palestinian refugee camp in Lebanon. From HUMAN FLOW, an Amazon Studios release. Photo courtesy of Amazon Studios. For Ai, the distressed refugees he witnessed coming off the boat that day in Lesbos weren’t simply people in peril, they were family in despair. “They could be my children, could be my parents, could be my brother” as he explains, “I don’t see myself as any different from them”. 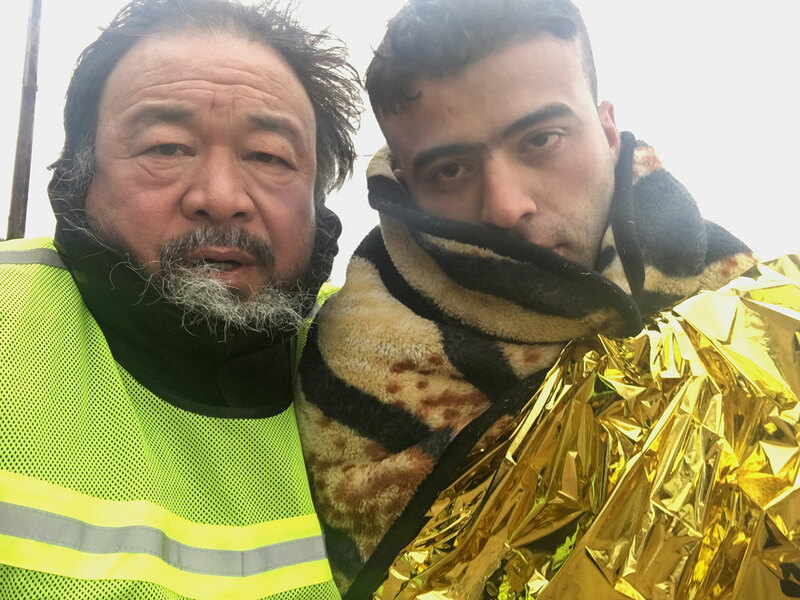 Shaken by what he saw, Ai has since spent his time and resources documenting and drawing attention to the global refugee crisis, creating several ambitious projects to express its unfathomable human toll. 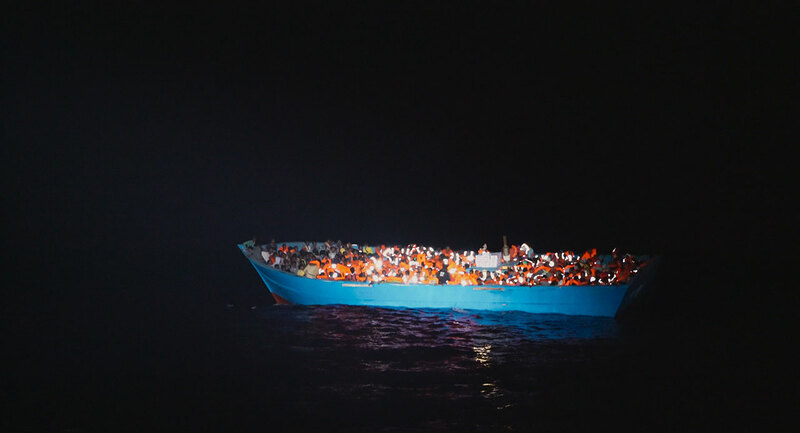 Most monumental of these projects were “Law of the Journey”, a 70-metre-long inflatable boat with 258 oversized, faceless refugee figures, exhibited in the National Gallery of Prague in 2017, “Laundromat”, in which he filled a New York City gallery with the discarded clothing and personal belongings left by refugees in an informal migrant camp in Idomeni, Greece, and his creative use of an enormous amount of used life jackets he collected in Lesbos, 3,000 of which were used to drape the six enormous pillars of Berlin’s Konzerthaus and another 1,000 to create 201 lotus flowers which were floated in a pond at the Belvedere museum in Vienna. An old woman in Kutupalong-Camp in Ukhia, Bangladesh. From HUMAN FLOW, an Amazon Studios release. Photo courtesy of Amazon Studios. 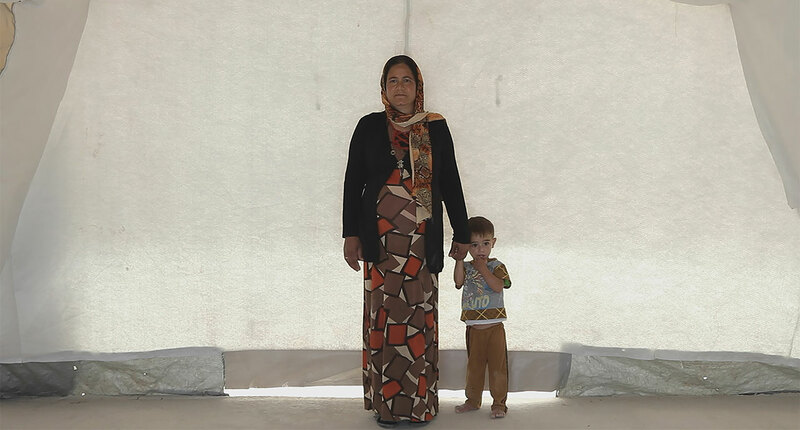 Mother and son in Shariya Camp, Iraq. From HUMAN FLOW, an Amazon Studios release. Photo courtesy of Amazon Studios. Whereas Ai's conceptual installations draw our attention to the enormity of the issue, Human Flow goes one step further by immersing us into its relentless particulars. We have probably already learnt about the numbers of refugees stuck in detention camps or those lost at sea, and we may have heard of places like Lampedusa and Idomeni, but we haven’t experienced the harrowing trip on those overcrowded boats crossing the Mediterranean, or what it’s like to march in the rain carrying all of your belongings on your back and a baby in your arms, or have the police throw tear gas on you to prevent you from crossing a border. These kinds of scenes, complemented by on camera testimonials and other more mundane yet as moving episodes such as watching a group of children trapped in a dismal refugee camp inventing games to play, invite us to identify with the people on the screen, asking us to consider what it’s like to live life at its most vulnerable. Despite the horrendous circumstances depicted, the film purposefully avoids presenting the refugees as victims. As editor Niels Pagh Andersen explains, the aim was “to get beyond any kind of pity or fear and see them as our fellow human beings” and “to offer”, as executive producer Andrew Cohen adds, “dignity, hope and humour during a harrowing odyssey”. At one point in the film, as the camera pans down a line of refugees, one of them holds up a sign with a single word, “respect”; it’s a poignant moment that encapsulates the filmmakers’ ambition and by extension, the human dimension of the crisis. Refugees at the Jordanian Syrian border in HUMAN FLOW, an Amazon Studios release. Photo courtesy of Amazon Studios. 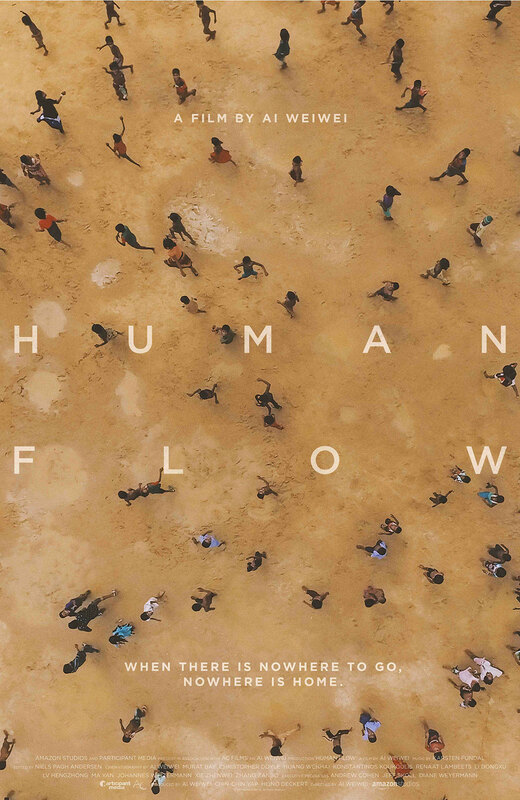 In HUMAN FLOW, an Amazon Studios release. Photo courtesy of Amazon Studios.